Whether you are planning to install a composite or timber deck, the products you select for the construction of your deck’s substructure are vital. If you are building your deck substructure yourself, you have probably already considered to the various materials available for a solid, lasting deck foundation. But even if you are paying someone else to create your decking frame, you should still arm yourself with knowledge about the various products available so that you can ensure your deck is being built on a strong base. In this blog post, we’re going to look at the pros and cons of different substructure materials, and also shed some light on the key steps towards successful preparation and build. 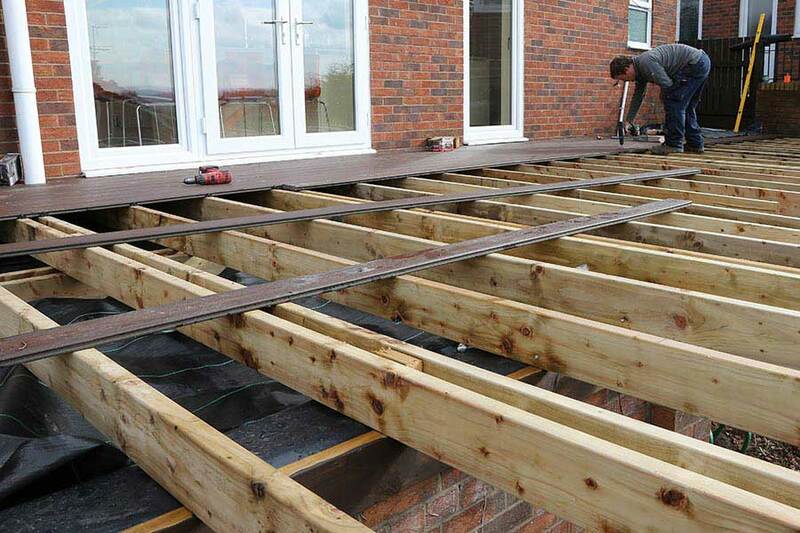 Pressure-treated softwood joists are the most commonly used material in the creation of decking substructures. They are also cheaper than the steel and composite deck framing materials on the market, and – if laid correctly – will provide your deck with a firm foundation that lasts at least 15 to 20 years, if not more. However, depending on the location of your deck and the weather conditions it is exposed to, timber deck framing can be problematic. If your frame is being built in rainy conditions, wet or damp joists can be heavy to work with and that can lead to mistakes being made during construction. If joists are not parallel then the deck may become unstable further down the line. Joists can also warp, twist, or rot over time if they repeatedly absorb a lot of water and then dry out again. 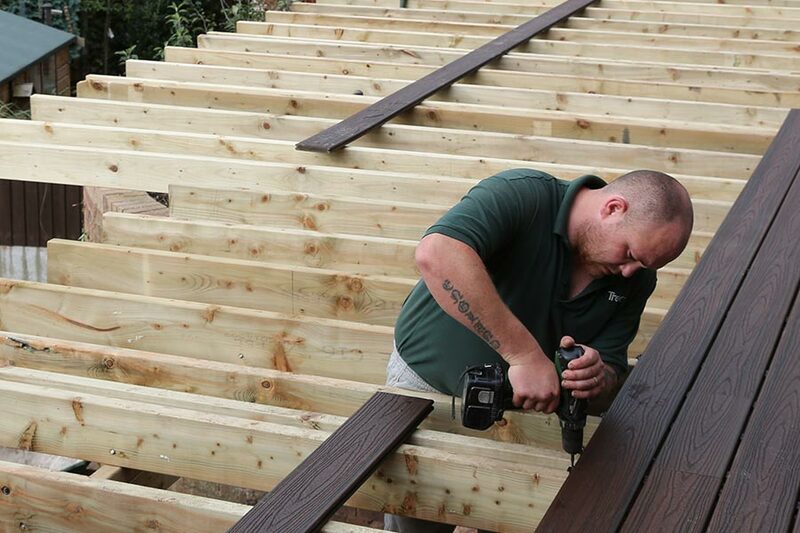 Most timber deck substructures are laid successfully and withstand normal weather conditions for many years, but if you know that your garden receives a lot of rainfall, it is important to be aware of the problems this can lead to. With a steel deck frame you can be sure that your substructure will never warp, sag or rot. Other advantages to using steel include the increased fire safety rating of steel substructure materials, the greater distances that steel joists and bearers can span, and the potentially long lifespan of your deck frame. The major downside to using steel is the cost; it is by far the most expensive decking substructure material. Other disadvantages include the difficulty in cutting, lifting and placing steel joists, the need to apply anti-rust protection treatments, and the increased installation time. Composite substructure products are made from hybrid materials that aim to offer the advantages of wood and plastic, with fewer downsides. Typically made from recycled material, composite substructure materials won’t warp, rot or rust. It is easy to work with too, so your installation time will be kept to a minimum. The cost of composite decking substructure components tends to be higher than timber (but not as expensive as steel) and, while it is weatherproof, it is not as strong a material as timber and this must be accounted for during construction. If you are laying your deck substructure yourself, it is wise to read up on the best approaches to preparing the type of space you are creating your deck in – there is a plethora of information available online to put you in the know. Mark out the deck area using string and pegs. Remove the sod from the ground where your deck will sit and pull up any weeds. Level the ground, sloping the ground away from the house to provide drainage (a 1:80 incline is recommended). Apply landscaping fabric and overlay it with pea shingle to a depth of 25mm. Once those steps have been followed, you will be ready to construct your deck-bearing frame, using the substructure material of your choice.